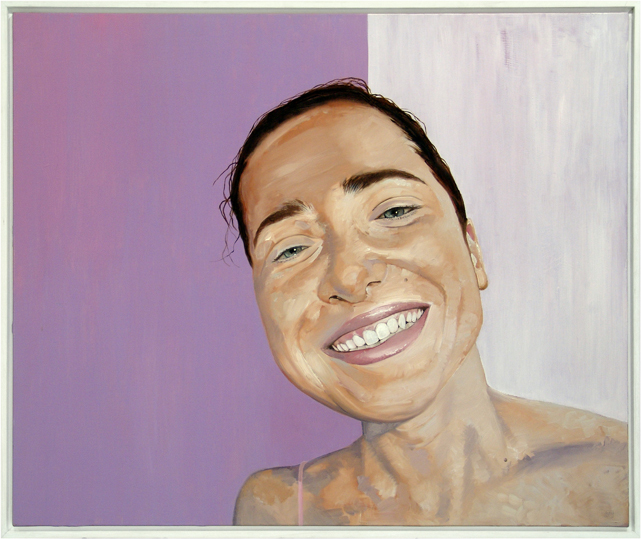 CM: The Purple Room is the largest of a series of portraits created by Sylvia Laiou. The picture presents with a high sense of intimacy the face of Kat, a personal friend of Laiou. In a trip of theirs to Venice, Laiou noticed Kat's bright face, as it gave out an optimistic and energetic feel. On that moment Laiou spontaneously thought of taking a photograph of her friend's face as a pleasant souvenir. When later the desire was born in her to use the aforementioned photograph as a model in painting, she chose to retain the distortion of the zooming lens, which brings the gaze closer to the viewer. By that solution Laiou accentuated the upward viewpoint, which added to the admiration she felt for her friend's positive character. Notwithstanding her broad and shining smile, which is the composition's strongest point, her eyes on a second plane are especially attractive - with a color that is determined everytime anew by the light - for bringing out a vivid light despite their squintness. The background's purple color, mentioned in the title, was not the real color of the space in the photograph, but the color that the painter thought matches a face, like Kat's. It is a light purple, which lends itself strongly to yet another colorless level in the background. More importantly, the Purple Room emits the calm and stability of Kat's inner world.